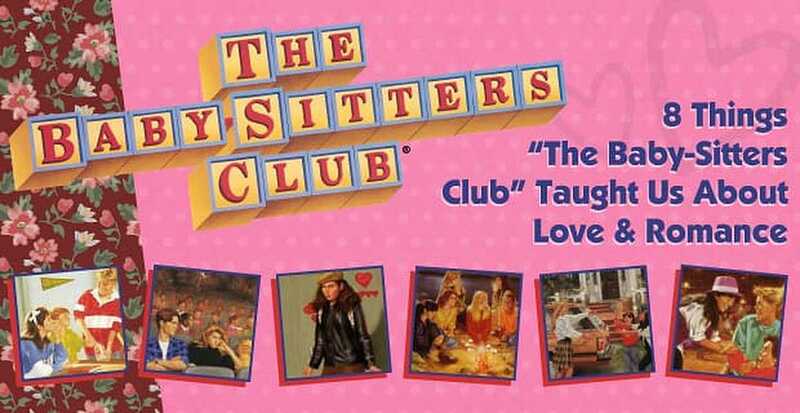 The Short Version: In the ‘90s, many a young girl read or watched “The Baby-Sitters Club” and fell in love with the bubbly babysitters from Stoneybrook. Written by Ann M. Martin, “The Baby-Sitters Club” series focused on a group of friends, between ages 11 and 13, as they tackled life’s challenges together. These upbeat chapter books imparted valuable lessons about love and romance, from how to handle awkward first dates to how to cope with parental divorce. Throughout 131 books, the message of “The Baby-Sitters Club” series is consistent: with good friends by her side, a girl can get through anything. As a kid, trips to the library were like sacred pilgrimages to me. I chose books with great care. I’d walk slowly along the shelves, letting my fingers drift across the spines, and wait for a word or a picture to catch my eye. “The Baby-Sitters Club #59: Mallory Hates Boys (And Gym)” hooked me immediately. I hated gym, too! The book looked sassy and amusing, with a strong female lead folding her arms on the cover, so I added the slim paperback to my pile and thus began my “Baby-Sitters Club” phase. 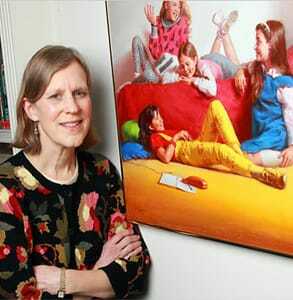 Author Ann M. Martin wrote the first book in “The Baby-Sitters Club” series in 1986. “The Baby-Sitters Club” series attracted me because the characters were so relatable and fun. The pre-teen girls get into a lot of hijinks as they run their babysitting club, and they deal with important issues like friendship, jealousy, divorce, and love. I wasn’t the only middle schooler carrying the chapter books in my backpack — “The Baby-Sitters Club” series by Ann M. Martin published 131 books between 1986 and 2000. To this day, the celebrated series has sold over 176 million copies. These simple stories continue to resonate with young audiences because the girls’ experiences and passions are universal. Readers of the BSC series learn about life and love by seeing it through the perspectives of Kristy, Mary Anne, Claudia, Stacey, and all the babysitters who would come after them. To give you a trip down memory lane, we’re going to share eight things “The Baby-Sitters Club” taught us about love and romance. 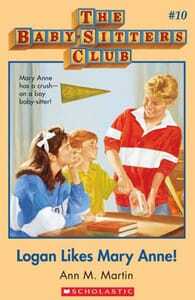 In “The Baby-Sitters Club” series, Mary Anne dates the cutest boy in her middle school. Mary Anne is head over heels in love with the Cam Geary (aka Cary Grant) look-alike before she even knows he’s a babysitter, too! What a coincidence! Logan volunteers to join the Baby-Sitters Club and falls for Mary Anne despite a series of awkward moments, which include accidentally kicking her shoe off at a school dance. The first stages of their romance were a bit clumsy, but you can’t deny chemistry. Author Ann M. Martin has said she based Mary Anne’s character on herself, so it’s no wonder she hooked the character up with a Southern hunk who embodies every pre-teen girl’s dream date. In “The Baby-Sitters Club,” the girls often act a little foolish around the boys they’re crushing on. Mary Anne turns into a tongue-tied statue when she first talks to Logan, Stacey acts like a servant to a lifeguard in Sea City, and Dawn completely changes her image to impress Logan’s cousin Lewis. Dawn learns how to behave on a date in “Dawn’s Big Date.” Actually, she learns how not to behave. It all started with a New Year’s Resolution to get a boyfriend. With Logan’s hot cousin coming to town, Dawn will do anything to get him to like her. She chews bubble gum and wears a lot of eye makeup to seem cool, but she ends up alienating her date by crying in the movie theater and having nothing to say in the car. In the end, Dawn realizes she was so caught up in taking the advice of dating articles and fashion magazines that she stopped being herself. She apologizes to Lewis for acting strangely, and they agree to start fresh. They go on a date to a bowling alley, where Lewis kisses Dawn. Turns out, the best date behavior is just being yourself. 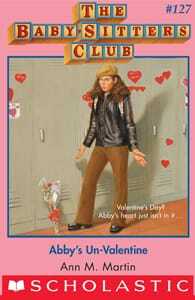 In Book #127 “Abby’s Un-Valentine,” readers enjoy a comic look at a cynical girl caught in a love triangle. From the outset, Abby makes it very clear that she hates Valentine’s Day — she simply doesn’t see the point. Don’t like a guy? Take a page from Abby’s playbook and pass him off to your sister. Abby is independent and strong-willed, and she serves as a good role model for single girls. Unlike many of the babysitters who came before her, she doesn’t go all gaga over boys. While most girls would be positively giddy to find out they have a secret admirer, Abby flatly rejects the advances of her lovesick classmate Ross Brown. Ross invites her to the school’s Valentine’s Day dance, brings flowers to her door, and compliments her during English class, but Abby just wants to get rid of him. So she hooks him up with her twin sister. By playing matchmaker, she makes everyone happy as the new couple goes off to the dance together, and she goes to the movies with her friend Kristy. “The Baby-Sitters Club” emphasizes in this story that Abby doesn’t need a date to be happy — she’s doing fine on her own and shouldn’t feel pressured to go out with someone she doesn’t like just because it’s Valentine’s Day. You go, girl! Published in 1997, “The Baby-Sitters Club Super Special #8: Baby-Sitters at Shadow Lake” is part ghost story and part romantic comedy. While at camp, Jessi meets a cutie named Daniel and flirts with him but feels guilty because she’s got a long-distance boyfriend, Quint. She eventually fesses up to Daniel that nothing can happen and remains true to her ballet-dancing boyfriend. In an embarrassing plot twist, it turns out Daniel has a long-distance girlfriend. Jessi scampers away, learning a valuable lesson about the difficulties of long-distance relationships. Mary Anne experiences something similar in “Mary Anne and Too Many Boys.” She goes to dinner and walks along the boardwalk with Alex, even though she’s dating Logan. She feels guilty until she finds out Alex has a girlfriend. No harm done. The babysitters see how tempting it can be to be unfaithful in a long-distance relationship, but they come to their senses before it goes too far. In high school, there’s always that on-again-off-again couple who’s passionately in love one moment and can’t stand each other the next. In the BSC series, Mary Anne and Logan keep readers wondering if they’ll ever make it work. Long before “Twilight,” hopeless romantics fawned over BSC’s iconic couple, Mary Anne and Logan. Mary Anne’s romance with Logan had its highs and lows, but they kept coming back to each other because the bonds between fellow babysitters are so strong. And it doesn’t hurt that Logan looks like a movie star. In book #46 “Mary Anne Misses Logan,” readers learn that sometimes when you take a break from someone, you realize just how much they mean to you. Mary Anne thought she was sick of Logan, but once they go separate ways, she misses him and goes to great lengths to reconnect over a school project. “Mary Anne and Too Many Boys” portrays the girls on a summer trip to Sea City where lots of romantic drama unfolds. Mary Anne juggling two boys, Stacey gets dumped, and there’s a secret admirer on the loose. Vanessa has been pouring her heart out in anonymous love letters to Chris — but he thinks they’re from Mallory! When he asks Vanessa to ask Mallory out for him, the irony is heartbreaking. She realizes that even though she’s been fawning over the cute ice-cream scooper for weeks, he’ll never like her in that way. In “Boy Crazy Stacey,” also set in Sea City, Stacey gets turned down by 18-year-old lifeguard Scott only to get her first kiss in the Tunnel of Love by Toby (who later dumps her because he doesn’t want to be tied down). The book ends with her crushing on yet another boy, Pierre, at the ski lodge. Stacey teaches girls an important lesson: Sometimes rejection leaves you feeling devastated — but there’s always another fish in the sea. “The Baby-Sitters Club” was no stranger to family drama and discord. Ann M. Martin wrote flawed characters who encountered real-life struggles, including chronic illness and divorce. Babysitters Kristy, Dawn, and Stacey all went through parental divorce in the course of the series. “Welcome Back, Stacey!” explores divorce from a child’s perspective. In book #28 “Welcome Back, Stacey,” Stacey knows her parents have been fighting over money, but is still furious to hear they’re splitting up. She initially tries to stop them by arranging romantic meals and carriage rides, but to no avail. After she accepts her parents won’t reconcile, Stacey faces a tough decision: Will she stay with her dad in New York or move back to Stoneybrook with her mom? Predictably, she chooses to return to her friends. Though the title gives away the ending, the heart of the story lies in Stacey’s emotional journey to come to terms with her parents’ divorce. The BSC series even covers the issue of parents remarrying when Mary Anne’s dad proposes to Dawn’s mom and the two friends become stepsisters. In book #30 “Mary Anne and the Great Romance,” the girls find out when two families merge into one, there are some growing pains involved. In “The Baby-Sitters Club,” crushes come and go, but the girls’ friendship remains strong. Despite heartbreak, jealousy, and family drama, the babysitters stick together. They comfort one another when times are down and celebrate when things get better. From their good example, readers learn the meaning of true friendship. With the support of their fellow club members, these girls can get through anything. From book #1 “Kristy’s Great Idea” to book #131 “The Fire at Mary Anne’s House,” “The Baby-Sitters Club” series ushered millions of readers into adolescence with chapters full of humor and fun. This widely popular book (and television) series has brought joy and comfort to many boys and girls since it was first published by Scholastic in 1986. I learned a lot about how adolescent dating works by reading “The Baby-Sitters Club.” Because I saw myself in many of the characters, I took the lessons of Mary Anne’s breakups, Mallory’s stubbornness, and Stacey’s short-lived crushes to heart. The books weren’t just entertaining ways to spend an afternoon — they were guidebooks on how to be a good friend, how to get over rejection, and how to love with an open heart.